﻿ Best Price on Casa De Campo in Tela + Reviews! Featuring a garden complete with a terrace and BBQ facilities, Casa De Campo is a self-catering accommodations located in Tela. Free WiFi access is available. 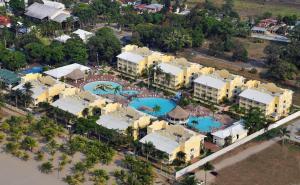 Cable TV is provided in each air-conditioned apartment at Casa De Campo Tela. Select units feature a full kitchen and a private bathroom. Others feature coffee-making facilities and a shared bathroom. A shared lounge is available on site. The property offers free parking. Ramón Villeda Morales Airport is located 36 mi from the accommodations. When you arrive in Tela, please call the property for directions. The contact information is in your booking confirmation. Payment before arrival by bank transfer is required. The property will contact you after you book to provide instructions.